We have been working long and hard on our little Rockwood camper project. The “new” camper is pretty tiny compared to our Santa Fe, so I love seeing what others have done with their smaller spaces. Storage is definitely an issue, but a smaller camper can provide flexibility that larger campers cannot. 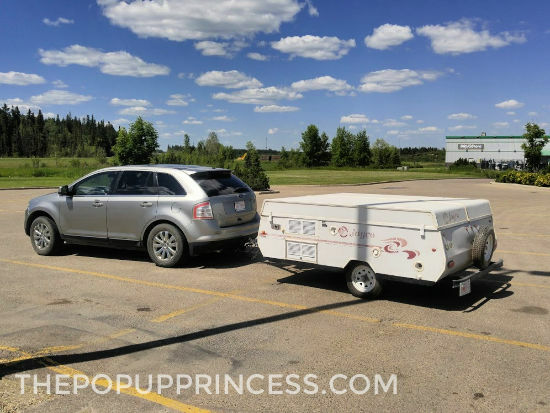 And if you are a minimalist camping family, those little tent trailers can provide all the amenities you’ll ever need. That was definitely the case for Jess. She and her family loved to tent camp and didn’t want to lose that feel sleeping out in nature. 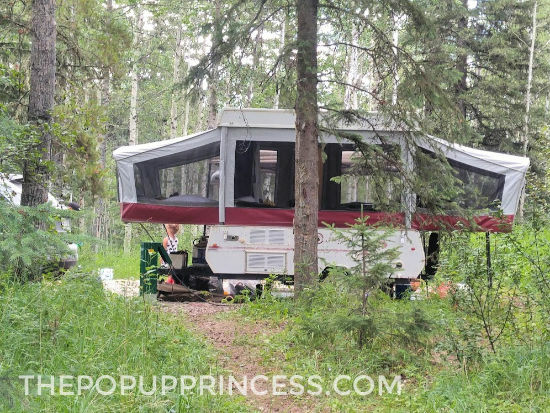 Because their kids were young, they needed to make camping trips a little easier. They felt a pop up camper would be a good compromise. 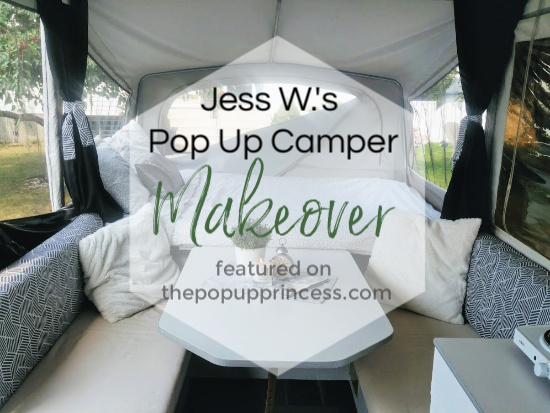 Jess started looking for an older pop up camper, one that was lightweight and easy to pull, but that was also in fairly good condition. Ugly and dated was okay by Jess. 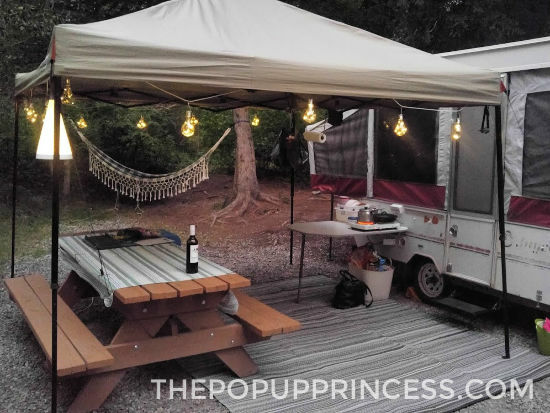 She didn’t mind doing a little refresh, so long as the camper had good bones, a fridge, and a heater. They found this small 1995 Jayco Eagle 8 pop up camper that fit the bill. It had a fridge, heater, sink, inside/outside gas stove top, and slept 4-6 people. It was small, cozy, and just perfect for their family of four. Jess gave herself two weeks and a modest budget of $400 to complete the renovation. 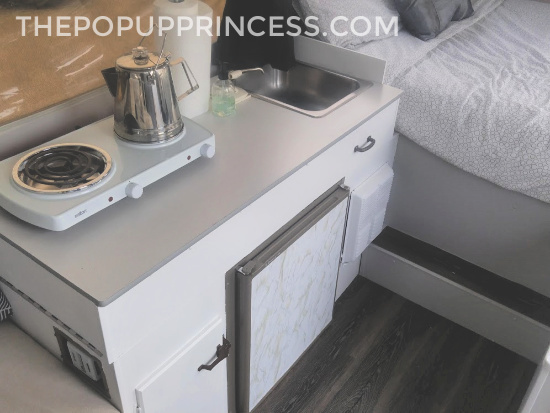 She had a fresh, light and airy look in mind, but she still wanted her camper to be family friendly. First order of business was to give the camper a good cleaning. The canvas was actually quite dirty, so Jess used Zep Mold & Mildew cleaner to get rid of the mildew and stains. It worked wonderfully, and the canvas looked as good as new. She had some leftover paint from a home project, and to save money, she used it on the walls and cabinets. Jess started by lightly sanding the cabinetry. 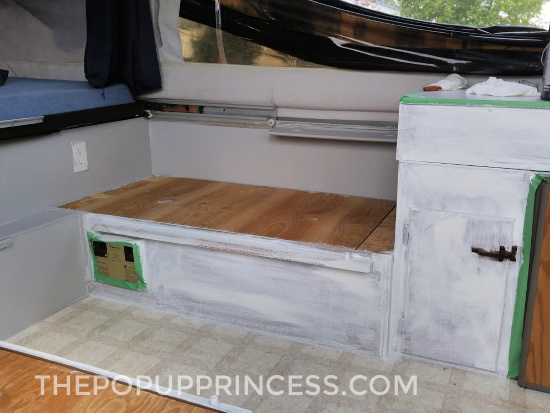 Then she applied one coat of Stix primer to all the faux wood inside the camper. She followed it up with two coats of Behr paint in “Zepplin” from Home Depot. The counter and table were already white, which fit her color scheme nicely. She didn’t have to do a thing to them. Jess covered the fridge and other side cabinet countertop with marble Con-Tact paper, purchased at Home Depot. She had originally tried to use dollar store adhesive paper, but it was cheap and creased and ripped easily. After wresting with the cheaper dollar store paper, she gave in and bought the more expensive Con-Tact paper at Home Depot. Jess said the difference was huge. Doesn’t the end result look beautiful? To cover the uglyl linoleum, she decided to use peel and stick plank vinyl flooring from Lowes. The color is called “Stormy Gray,” and Jess is absolutely thrilled with how it turned out. She easily installed it right over the original linoleum flooring with no issues at all. Jess removed all the covers from the dinette cushions, gave the foam a good cleaning, and let it dry in the sun. She bought fabric on clearance and some inexpensive cotton batting. 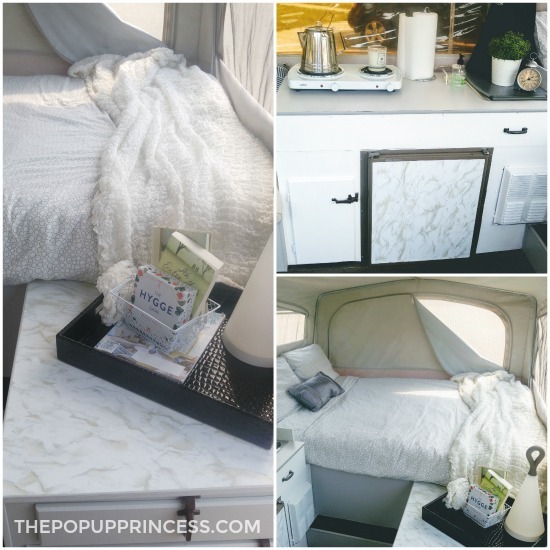 She wrapped the foam in the batting, covered it in the clearance fabric, and used a staple gun to attach the fabric to the plywood backing of the cushions. They turned out beautifully, and Jess loved how simple it was to do. No sewing required! Next Jess wanted new curtains, but didn’t want to spend a lot of time making them. Because she wanted a quick fix, she bought four long black curtains on sale at Jysk. Then Jess asked her mother to remove the top rings off each panel, cut them in half widthwise, and hemmed them them to the correct length. She purchased new curtain tabs from a local RV store, and her mother sewed them into the new curtains. The curtain tabs fit the original track perfectly, so she was able to reuse it. She finished up her makeover with some inexpensive bedding and accessories from Ikea. Gorgeous! I found this site after looking up “pop-up camper restorations”. Between here and Pop-Up Portal, I should have all the info I need for my new project after we retrieve it on Saturday. It’s a…pop-up trailer. I have no idea what brand, what age or what size it is! It has new canvas and a new fridge and it’s free; that’s literally all I know about it. An older guy had to go into assisted living and his kids just wanted the trailer gone so they gave it to the first people who promised to not just use it for target practice. My SO has borrowed tent trailers before and I’ve spent a lot of time in a 17′ Casita so between us we have sufficient cramped-camping experience. My SO and I are handy and have a lot of power tools. 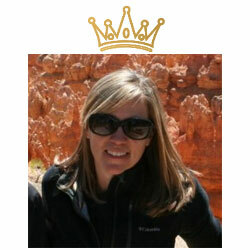 I’m a diy designer with 40 years of sewing experience and 3 sewing machines. We seem like the perfect people to embark on a project like this, but it’s still great to learn from other people’s experiences (nee mistakes). Forward ho! WOW free!! Can’t pass up that opportunity. We just bought our first pop up last week. Didn’t see this site until I had already put down the new flooring, in a hurry. Good luck with your new project, can’t wait to see the results!